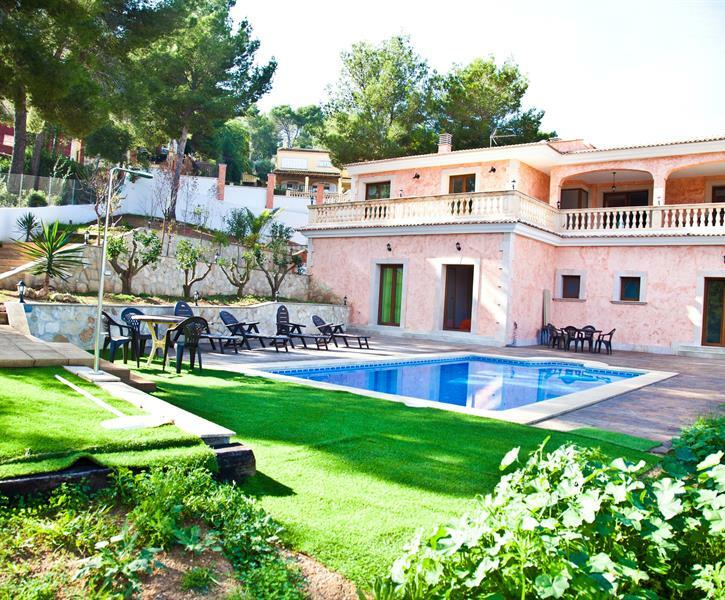 villa con 4 camere in affitto per le vacanze a Magaluf. Controlla tutti i dettagli, le foto e le recensioni dell'immobile n° 25639. Villa with air conditioning for everywhere, 4 bedrooms and 3 bedrooms. Big pool. Close of the main street of Magaluf. Spectacular newly built home with first quality made. It has 4 large bedrooms and large living room and a functional and modern kitchen. 3 bathrooms. The pool has a large terrace for sunbathing. Barbecue. Air conditioning throughout the house. It has a large terrace on the top overlooking the sea and the Bay of Palma, on the same terrace there is a table and chairs for 10 people. Final clean isn't included in the price. Spent 4 nights in the house which was very and clean. Walking distance to the Beach and to grossercy shopping. 7 Ladies travelling and had an evening on the nice terrace, but lokal police had been contacted by the neightbors, because we were just talking - no party. Also only 6 Wineglasses for an 10 people villa. It is a lovely poolhouse, and we had some fatastic days there. Very nice house with a great location and very suitable for a group of people including small children. The weather in Mallorca is probably supposed to be nice all the time, but when it's not a bigger indoor table would be nice, so that all 10 can be seated for dinner. Also, the kitchen lacks some equipment (a good knife for cutting, a cutting board, nice pans etc), but a part from that a really nice place. It's great that the house has both dishwasher and washing machine.